Happy Friday friends! We've made it through another week. Was it a good one? I have been pretty productive which is quite the shocker! Today I am working on something cute and fun and I'm pretty excited about it. I will share it with you next week. But oh how I love that pile of red! Nothing exciting going on here today. 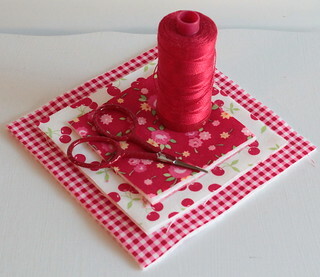 Just getting my stuff ready for a sew day on Sunday which includes making macaroni salad. Saturday we're off to a quilt show. Last night was fun! I went to a local guild where they had Dawn Heese as a speaker. She's the brilliant mind behind Linen Closet Quilts. Great fun! That is very pretty red fabric!